Chicago Printmakers Collaborative Turns 25, Don't Stop the Presses! LINCOLN SQUARE — Deborah Maris Lader has shown her paintings, sculptures and photography internationally, but perhaps her most significant achievement as an artist is a decades-long project that's still a work in progress. In 1989, Lader was freshly arrived in Chicago, having left her job as a printmaking professor at the University of Indiana-Fort Wayne to follow her husband to the Windy City. "There was nowhere to print, every shop was closing," she recalled. "And a light bulb went off." With her savings, Lader bought a print shop that was for sale and the Chicago Printmakers Collaborative was born, originally making its home at 1101 N. Paulina St. before relocating to its current address at 4642 N. Western Ave. in 1999. "When Jim Hirsch moved Old Town up here, he grabbed me by the hand and said, 'Come look at Lincoln Square,'" Lader said, referring to the folk music school's former executive director. "I was like, 'Ugh, it's so far.' And then we moved our house up here." Now celebrating its 25th anniversary, CPC has become a hub for the city's printmakers, renting out press time by the hour as well as leasing studio space to artists-in-residence. "For some printmakers, this is their primary studio," Lader explained. "We are the game in town to do lithography." CPC is also a magnet for hundreds of visiting artists and students who come from all over the world to teach and learn the centuries-old processes of lithography, etching and screenprinting. "I love being surrounded by people who are learning and inquisitive," Lader said, whether the student is working on developing a portfolio for grad school applications or is an absolute printmaking novice. "If you've never done any drawing," she said, "take our intro class and have some fun." Lader was herself a bit of a latecomer to printmaking. The Cleveland native originally intended to become a sculptor, which is what she declared as her major when she first entered college at Cornell. "I got there and after a year of making these big honking things, I missed drawing," she said. "I took a printmaking class and I'm working with wood and cool old machines ... drawing on wood, metal and glass ... I realized I found my medium." Though Lader still paints and sculpts and is also a member of the folk music trio Sons of the Never Wrong — "I think I have creative ADD," she said — all roads lead back to printmaking. 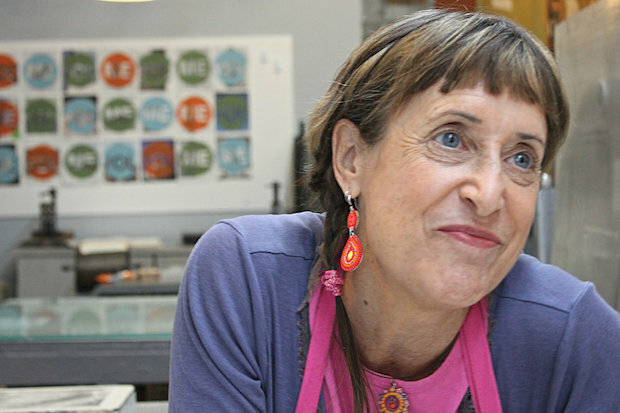 "I paint like a printmaker, I make music like a printmaker," she said. It's the opportunity to spark a similar passion in beginners and non-artists that instructors say is a large part of CPC's appeal. "It was so open-hearted and fun, teaching students who aren't doing it for a degree but who just want to learn to do something," said Molly Briggs, a CPC teaching alum who scored her first gig at the center after earning a master's in printmaking from Northwestern in the late '90s. Aaron Coleman, a current CPC instructor, echoed Briggs' sentiments. "The students who come here all want to be here. Some have taken the same class four, five or six times," said Coleman, who's also on staff at Northern Illinois University, which boasts a nationally-ranked printmaking program. Now a visiting assistant professor at the University of Illinois, Briggs described CPC as "a super communal place" and the "premier model of the collaborative nature of printmaking." In fact, when Briggs relocated to Champaign-Urbana, she missed CPC's collegial atmosphere so much, she founded her own press, which she called a "microcosm" of Lader's venture. "CPC had a really fundamental, formative effect on me as a teacher," Briggs said. "It is something I think will be with me always. It's about people coming together." John Himmelfarb, a working artist since the 1960s, signed up for a class at CPC after realizing that in all his years as a printmaker, he'd never actually printed anything himself, opting instead to hand off the labor to students or print shops. "I think I just enjoyed the process and meeting the people I'd met," Himmelfarb said of his time at CPC. "My feeling about the place has as much to do with the people one meets and the connections and relationships. It's created a community within the art community of Chicago." Briggs and Himmelfarb are two of the dozens of CPC veterans whose work is featured in "Rolled, Stoned & Inked," a 25th anniversary retrospective that runs through Feb. 28 at Expo 72, 72 E. Randolph St.
Lader, ever mindful of the greater CPC family, also created a 10-foot mural for "Rolled" out of photos she solicited from artists both past and present who aren't included in the show, having asked them to send in pictures of themselves wearing their CPC apron. "I want all the printmakers in it," she said of the mural. "I love printmaking, I love being an artist — it's just amazing to be able to be an artist in a city like this — but it's the community. I get to have this great group of people to be surrounded by." Although the 25th anniversary has provided Lader with an opportunity to reflect on what she's accomplished over the past two-and-a-half decades, the 53-year-old mother of two is equally focused on CPC's present and future. In October, CPC participated for the first time in the Chicago Architecture Foundation's annual Open House as a way of making the art of printmaking more accessible to the general public. "We had 750 people come through," said Lader. "When visitors come to the shop and watch someone printing and etching, they get it — 'Oh, that's so much work.' They love the art and craftsmanship." In an age when anyone can become a printer simply by pressing a button on their keyboard, interest in the deeply analog process of old-fashioned printmaking on presses remains strong, Lader said, in part as a reaction to the "digital bombardment." For printmakers — be they professionals or amateurs — the medium provides an outlet computers can't, she said. "They want to make something with their hands," she said. "It really feeds a lot of the senses. It feeds the soul." Ensuring that CPC is around to meet that need for decades to come is something that's been on Lader's mind of late. CPC, unlike many other entertprises in the arts, is not a non-profit. It supports itself not with grants — "I'm really bad at asking people for money," Lader said — but through income from classes, gallery sales, memberships and studio rentals. "The small business model forces you to be creative in how you solve your money problems," Lader said. "I tell people that I'm self-unemployed." Adding classes, attracting more members and expanding the gallery are all ways Lader could increase CPC's bottom line but any potential growth, she said, has to be of a manageable nature. "I have to be able to be an artist too," said Lader, adding that she's started to think about who she could bring in as a successor at CPC's helm. That hardly means she'll be hanging up her CPC apron any time soon. Said Lader, "I hope I'm 92 and still making etchings." Though CPC is typically only open to the public on Fridays and Saturdays, the center extends its hours in December for its annual Small Print Show, through Dec. 21. Stop by CPC noon - 5 p.m. Friday for a preview, or 11 a.m. - 7 p.m. Saturday and Sunday for the show's opening reception. CPC will be open noon - 5 p.m., Tuesdays through Sundays, Dec. 9-21. So what, exactly, is printmaking? It's a form of art that dates back to 1400 and often involves the carving of an image into wood, stone or metal, followed by the application of ink, and then the transfer of the image to paper. Lader offered DNAinfo.com a brief tutorial on etching, shown in photos below. An image drawn on a lithography stone with grease pencil. 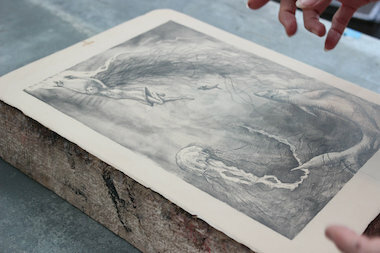 Once the image has been printed, the stone will be ground down until the drawing is erased, and the stone is ready for another litho. The first step involves covering a metal plate — copper, zinc or steel — in an acid-resistant coating. Using an etching needle (a sort of pen), the artist then scratches through the coating to draw the desired image. The plate is then dipped in an acid bath and the exposed metal is etched into the plate. Once the coating is wiped off, the plate is ready for inking, which fills in the etched grooves. The inked plate is placed on the press, covered with paper and "blankets," and cranked through a roller. The resulting pressure transfers the inked image from plate to paper. Voila, a print is born.